The next few weeks will feature two interesting eclipses – one lunar partial eclipse and one dramatic solar eclipse that will be visible over much of the continental United States. I will examine these two celestial events from a mundane perspective. For practicality, the charts will be displayed in wheel form cast for Philadelphia, PA., my location as well the USA’s birthplace. Astromaps for the events, of course, are not relegated to a specific place. The lunar partial eclipse will occur on 7 Aug 2017 at 2:10:32 p.m. EDT. The Sun will be at 15 Leo 25 and the Moon at 15 Aquarius 25. For those familiar with the 45-degree aspect series and the work of Reinhold Ebertin and others, this is an important degree since 15 degrees of any fixed sign is equal to the Aries Point a powerful indicator of impact on the world at large. Where will this eclipse manifest? Looking at the large map of the world, we can get an inkling of three main areas on earth were the eclipse is angular – Europe, Asia and North America. In Europe, the moon rises while the Sun sets through Italy, the Balkans, the border regions amongst Austria, Hungary, Slovakia, and the Czech Republic, Poland, and the Baltics. Expect news from these areas as far as leadership issues go. Pay special note of the Moon on the MC and Sun on the IC on the borders of India, Bangladesh, Nepal, Tibet, and western China. In North America, the Sun on the MC/Moon on the IC line goes through Guatemala, and Mexico before crossing the Gulf of Mexico and more or less following the Mississippi valley from Louisiana through Minnesota. This also crosses the New Madrid Seismic Area. 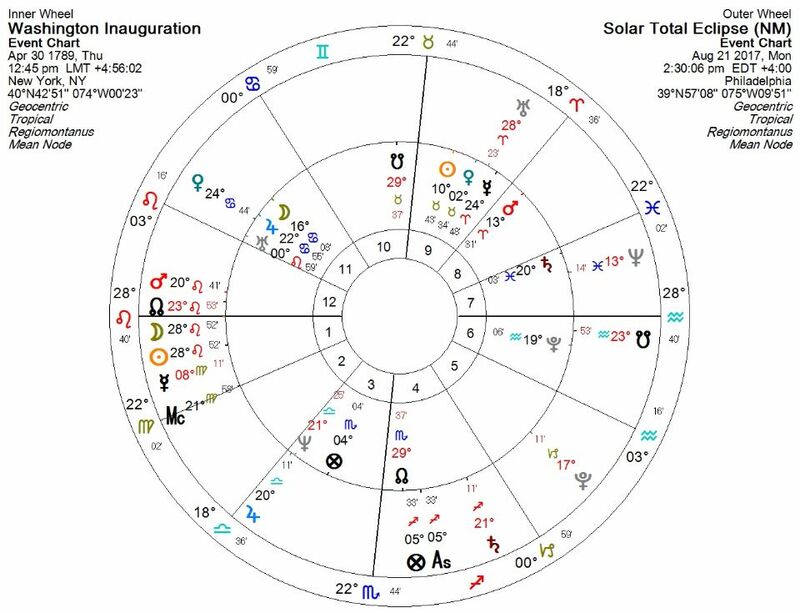 One of the foundational charts I use for the USA, George Washington’s Inauguration (30 April 1789) has the Sun in the 10th degree of Taurus, which the lunar eclipse (and the eclipse Mars) squares. Since it is daytime, the lunar eclipse is not visible in the Americas. The Sun is conjunct the star Dubhe, which is said to have the nature of Mars, is known to be arrogant, destructive, but also psychic. The lunar eclipse may also be compared to the most recent Presidential Inauguration chart. 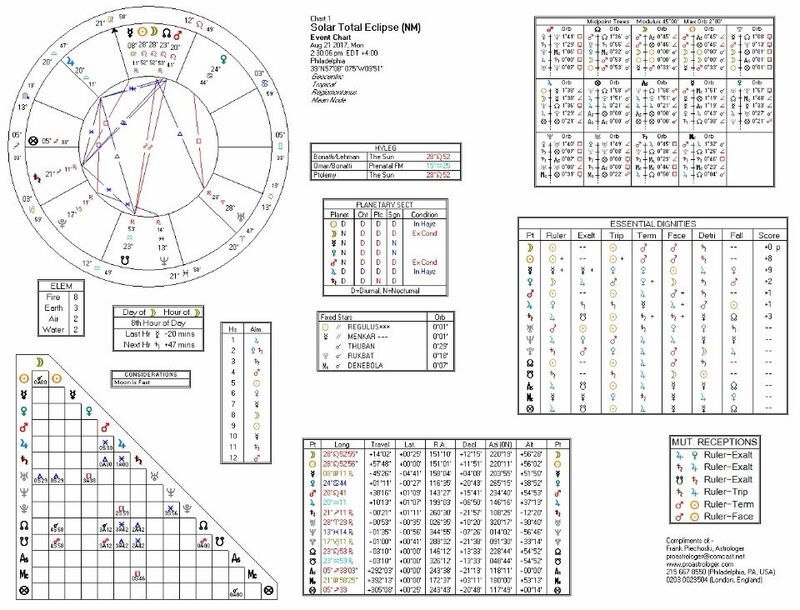 The eclipse axis squares the Inauguration’s ascendant/descendant axis, Mars square the Moon and quincunxes Neptune, and Jupiter squares Pluto. Moving on to the solar eclipse on 21 August 2017, which will be visible in the USA. The eclipse point at 28 Leo 52 is close to Regulus, the royal star and trines Uranus, the planet of revolutionary change. The sun is obviously comfortable in Leo, but Mercury is also well placed by sign in Virgo – in both Domicile and Exaltation. Mercury is, however retrograde so things don’t always go as planned. As to where the eclipse will manifest, it is usually said that the effect of a solar eclipse is strongest where it is visible. For this eclipse, that means the continental USA. The path of totality for the eclipse is the bright red line in both illustrations below. Note where planetary lines cross the eclipse path and places nearby to discover some possible hot spots. Some of these places include Bend, OR (Uranus on descendant), Cheyenne, WY (Mars on MC), Lincoln, NE (eclipse on MC), St. Louis, MO (Mercury MC), and Asheville, NC. One should also note the eclipse’s contact with USA foundational charts and other relevant mundane charts. Any 4 July 1776 chart will have the eclipse point quincunx its Pluto, the South Node on its Moon, and Venus on its Mercury. The Washington Inauguration also chart shows some resonance. I tend to use this more as a chart of the USA government in general and the presidency in particular. The eclipse falls on the Washington Inauguration ascendant and squares its Nodal axis, Jupiter conjoins its Neptune, and Mars opposes its Pluto. 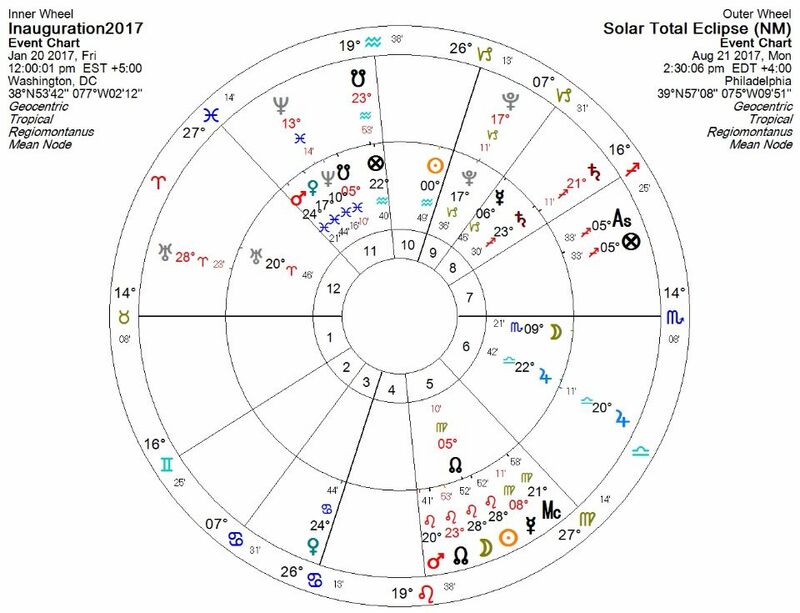 Here is the chart of the USA’s most recent Presidential Inauguration with the Solar eclipse displayed around it. The eclipse Mars opposed Fortune with South Node on Fortune – and in the degree of Saturn – do not bode well. In summation, these eclipses will have a powerful effect, especially in regard to the current USA government. 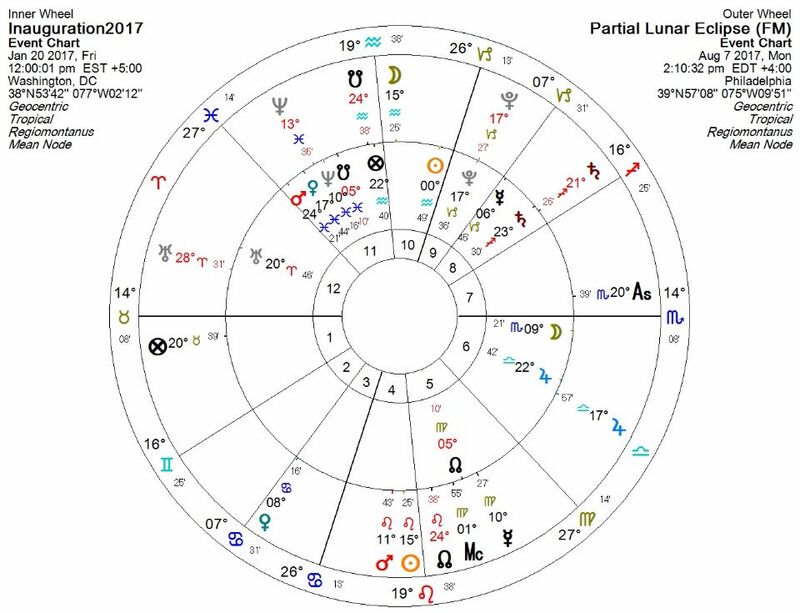 These eclipses are now triggering the long-term transformative nature of Pluto on the USA’s foundational charts. There are things going on behind the scenes that will not come out until after the Solar eclipse on 21 August 2017 – and likely not until after 4 September 2017 when Mars passes the eclipse point and Mercury stations direct.